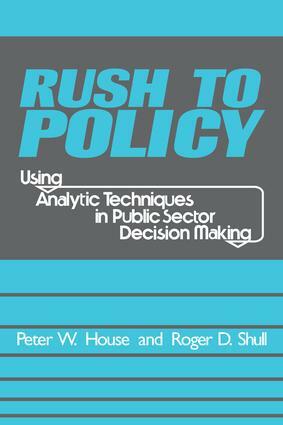 Rush to Policy explores the appropriate role of technical analysis in policy formation. The authors ask when and how the use of sophisticated analytic techniques in decision making benefits the nation. They argue that these techniques are too often used in situations where they may not be needed or understood by the decision maker; where they may not be able to answer the questions raised but are nonetheless required by the law. House and Shull provide an excellent empirical base for describing the impact of politics on policies, policy analysis, and policy analysts. They examine cost benefit analysis, risk analysis, and decision analysis, and assess their ability to substitute for the current decision making process in the public sector. They examine the political basis of public sector decision making, how individuals and organizations make decisions, and the ways decisions are made in the federal sector. Also they discuss the mandate to use these methods in the policy formulation process. The book is written by two practicing federal policy analysts who, in a decade of service as policy researchers, developed sophisticated quantitative analytic and decision-making techniques. They then spent several years trying to use them in the real world. Successes and failures are described in illuminating detail, providing insight not commonly found in such critiques. The authors delineate the interaction of politics and technical issues. Their book describes policy analysis as it is, not how it ought to be.